George Saville is sure Northern Ireland should have been awarded a first minute penalty kick against Bosnia and Herzegovinia. The visitors ended up leaving Windsor Park with a largely undeserved 2-1 victory but the typically impressive Saville says it could, and should, have been a different story. The Middlesbrough midfielder was upended just 34 seconds into the game. Referee Pavel Kralovec waved away the claims, much to the hosts' disappointment. Saville nicks the ball and appears to get tripped in the box, but the referee says no penalty! And the man himself said after the match that there was contact made by the defender. "I haven't looked at it back but there was contact there and I think it's a pen," Saville told Sky Sports. "I felt contact - there's no point going down. I'm through on goal if I get past him. That changes the game. I think it's too early and the ref hasn't given it. "But we've got to take our chances and we've paid the price for that. We can't blame it on that decision - we've shot ourselves in the foot." It was a view backed by boss Michael O'Neill. "We should have had a penalty, I think it's pretty clear," he told Sky Sports. "It's early in the game, maybe it's a difficult one for him to give." 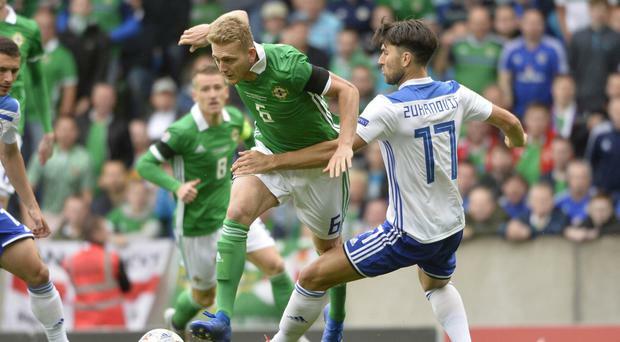 Goal-scorer Will Grigg says the result makes NI's UEFA Nations League trips to Austria and B&H all the more significant. "Obviously you want to win your home games and this makes those games more important. We've made this place a fortress and with performances like that, you expect to win," he said on Sky Sports. "I think we probably won't play much better than we did in the first 20 minutes. I thought we were brilliant. It comes against the run of play and it knocked the stuffing out of us for a few minutes. To be fair to the lads, we carried on playing, created loads of chances and it was just one of those days. It wasn't to be. "It's great to be back involved. We've got a great bunch of lads. It's nice to get the goal but the whole point of today was to get the win, and we haven't done that."